Show off your sophisticated style with this simply beautiful Sinfona Lady Eye Mask - Blue by Simply Masquerade - the perfect accessory your party. 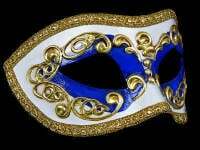 Make an understated yet elegant statement with this must-have masquerade mask, designed in the traditional Venetian style of aged blue & white handpainted base embellished with gold swirls & finished with sheet music designs. 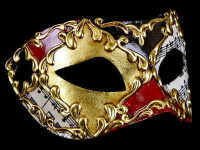 This gorgeous ladies masked ball mask will instantly spruce up your party clothes & will give a luxurious touch to your favourite posh cocktail dresses too, making it an essential item for all of your stylish balls this year. 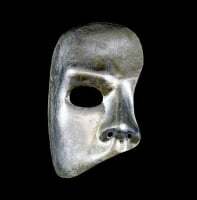 Mask Is Made From: Papier Mache with traditional black satin ties for a comfortable fit.